Join fellow runners of all ages in the Kilted Mile Run 2 p.m., Sunday, Sept. 16. Don your kilt and be cheered on by bagpipes and fans! Entry fee is $10 in advance and includes Sunday only admission to the festival. Registration is on-line here or will also be available 12:30 p.m.-1:30 p.m. at the CD/T-Shirt Tent in the center area of the park. Trophies awarded to top finishers. Additional awards include “Bonniest Knees”, “Best Step Dance in a Kilt”, “Best Irish Singer” and “Best Dressed Kilt”. You have to see this one! If you register in advance be sure to print off your proof of registration and show it at the admittance gate on Sunday only for free admittance to Historic Military Park at White River State Park. 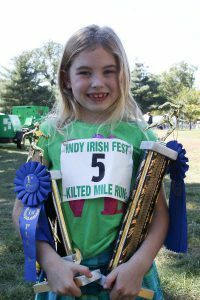 If not pre-registered online you must pay admittance to Irish Fest then pay to register for The Kilted Mile at the CD/T Shirt tent. Pre-registered is the way to go !